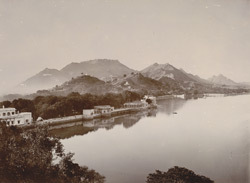 Photograph of the Ana Sagar Lake at Ajmer in Rajasthan, taken by Lala Deen Dayal in the 1880s, from the Curzon Collection: 'Views of places proposed to be visited by Their Excellencies Lord & Lady Curzon during Autumn Tour 1902' . Lord Curzon served as Viceroy of India between 1899 and 1905. Ajmer was the capital of the Chauhan Rajputs, and founded in 145. The town of Ajmer lies at the foot of Taragarh Hill on the edge of the Ana Sagar, an artificial lake. The Mughal emperor Shah Jahan (r.1627-58) built marble pavilions on the embankment or bund of the lake. This view shows the lake with hills behind.